Get Glowing | Life. Realized. 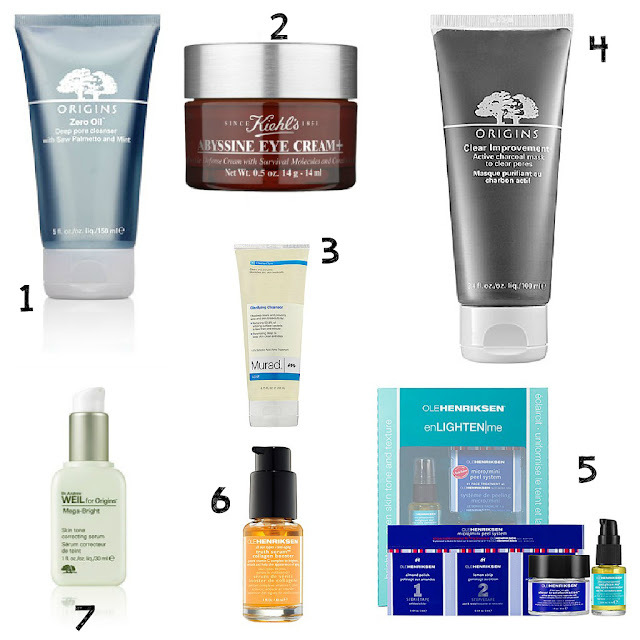 I wrote about my skincare faves way back when only my husband read my blog. That might still be the case. If so, this one's for you, Honey. Because I like to experiment with different creams, serums, and lotions, beauty products are an ever-revolving door around here. Late this last summer, I stopped by an Origins counter within Macy's to look into their foundation. What I ended up with was a mini-facial and bunches of samples. And some products that will never leave the rotation. I don't know why I didn't try their stuff sooner! It's lovely, gentle, high quality and mid-range in terms of pricing (more Clinique than Perricone). I can't imagine those crazy expensive brands could do a better job. 1. Origins Zero Oil cleanser: My skin isn't breaking out as much these days, but I'm still oily. This is the perfect cleanser...non-drying, gentle, and overall lovely. I got a sample at the counter and had to buy a bottle when it ran out. 2. Kiehl's Abyssine Eye Cream: This was a Birchbox introduction, and I have since ordered the full size product. A little goes a long way, and my eye area looks and feels refreshed when I wake up. 3. Murad Clarifying Cleanser: This bad boy got me through some pretty rough skin days. It doesn't dry out my skin and definitely does the job. I use it now when my skin is acting up, and will always keep it on standby. Oh, and a single bottle goes a looong way (I'm going 18 months strong on the same one). 4. Origins Clear Improvement Charcoal Mask: This was a "Sure, I'll buy it" at the Origins counter this summer. I finally got around to using it a couple months later and for the first time in my life I'm a regular mask user. It was love at first use. My skin glows like CRAZY for days after. It's on my face as I write this. 5. Ole Henriksen Enlighten Me Kit: I bought this set when I came back from California this summer with blotchy skin thanks to our rental Jeep. Despite liberal sunscreen use. It wasn't bad (my husband said I had to point it out in bright lighting for him to even see it), but I wanted to nip it in the bud. I used the 3-step part right away and am still milking the serum and night cream for all they are worth. My skin feels good and the spots (although not gone) are much better. The night cream is full size (or close), so it will be around a while. Definitely a good buy. 6. Ole Henriksen Truth Serum: This is an absolute favorite of mine. I have so many samples, I've never had to splurge on a full size bottle. Once the Enlighten Me serum is gone, I will be switching back to this at night. It makes my skin glow. Seriously glow. 7. Dr. Andrew Weil for Origins Mega Bright serum: This is a fairly new friend. Sephora was having their 20% discount about a month ago and I went for it. Best. Move. Ever. Besides having my son, marrying my husband and getting a college degree. But you get my point. I use it in the morning and my skin looks amazing all day. And it doesn't cause my makeup to ball up like other serums. I can't imagine not using it forever. Amazing stuff. It goes without saying that I have skincare ADD. I love trying new products, and the regular influx of samples thanks to frequent Sephora purchases and my monthly Birchbox keep my experimenting. In fact, I hoarded compiled so many samples last year that I was able to make up beauty bags for my sister and sister-in-law as Christmas gifts. It was so fun. I'm doing it again this year for someone, so I'll post on it soon. What are your tried and true skincare must-haves? PS I'm your 100th follower! WAHOOO! I need to try some of these, they look great! :) Love your blog! Thanks, Rachel! I look forward to reading your blog, too! oh I think I'll take all of these please.